Located close to the West Sussex coastline in Worthing, Carolyn House is an age-exclusive development with 72 flats, offering a mix of one and two-bedroom dwellings spread over three storeys, created for residents aged 60 or over. It is managed by Places for People, an award-winning property management, development, regeneration and leisure company which owns more than 180,000 homes across the UK. With outdated electric storage heating in all 72 flats, Places for People knew that heating system upgrades would reduce bills and improve comfort for residents. TMS Electrical Contractors Ltd, based in Rudgwick, Horsham, was instructed to specify the most suitable replacement – and Dimplex Quantum was the obvious choice. TMS Electrical Contractors removed old storage heaters from the bedrooms, hallways and living rooms before installing Dimplex Quantum heaters in living rooms and, for two bedroom flats only, in the hallway. The bedroom heaters were each replaced with a Dimplex EPX panel heater, providing a cost-effective combination of off-peak and direct-acting electric heating appliances that would best suit the lifestyle and usage habits of the residents. Dimplex down flow heaters and towel rails were installed in the bathrooms, and all hot water cylinders were also replaced as part of a whole-dwelling solution in all 72 flats. As a member of the Dimplex Quantum installer network, TMS Electrical Contractors knew the installation and usability benefits of this unique system. Easy to install and designed to cover the footprint of legacy storage heaters, the Dimplex Quantum system stores energy during cheaper, off-peak periods and delivers heat when it is most needed, through the day or night. It is easy to use, with an intelligent controller that adapts to the lifestyle and habits of the user, offering enhanced controllability and comfort when compared to the previous storage heating systems that were replaced. Independent research also shows that when combined with direct-acting electric panel heaters like the Dimplex PLX heaters installed at Carolyn House, Dimplex Quantum can reduce heating bills in a two-bedroom flat refurbished to typical 1990s Building Regulations by up to £120 per year compared to a system of static storage heaters with direct-acting panel heaters. Inevitably, the biggest installation challenges in this age-exclusive development were related to the age, dependence and health of the residents. TMS Electrical Contractors arranged individual appointments with all residents in their home to explain the works, check there was no furniture in front of heaters and answer any questions. Where necessary, family members and trusted friends were invited to attend too. The heaters needed to be switched off 24 hours before removal to ensure they were cold, and residents had to be present to give engineers access to their flat, but hospital visits or other appointments often meant that installations had to be changed at the very last minute. This was made possible only by regular communication with residents and an up-to-date standby list prepared on a weekly basis. 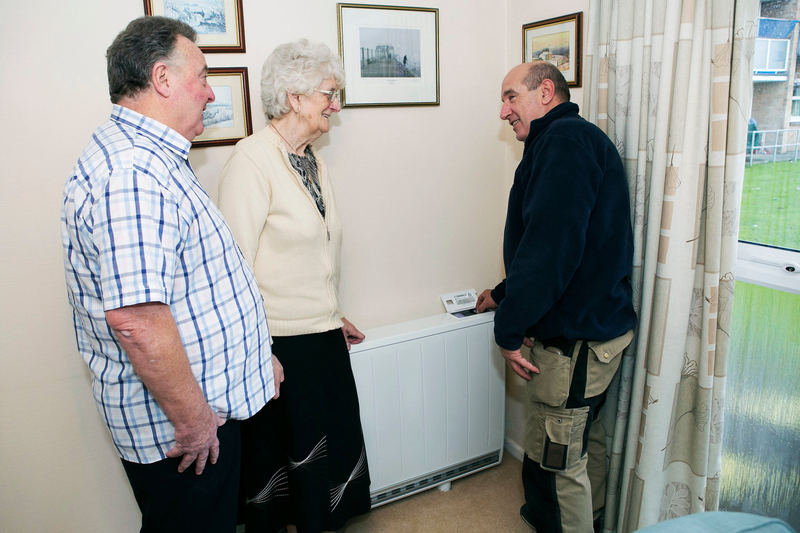 After the installation, residents were shown how to set the heaters and left with written guidelines. A walk-in training day also took place at Carolyn House for any residents that needed further guidance. Andrew Walder, Managing Director of TMS Electrical Contractors Ltd, said: “This was a successful heating upgrade in 72 dwellings, made possible thanks to the planning and hard work that went into it. We know from previous projects that Dimplex Quantum offers a controllable, cost-effective solution for dwellings of this type and it was the obvious choice for Carolyn House. Sarah Watkins, contract delivery manager at Places for People, said: “The upgrade of the heating provision at Carolyn House has gone really well – largely to the excellent project management by TMS Electrical Contractors and Fortem.